We’d love your help. Let us know what’s wrong with this preview of Three Wells of the Sea by Terry Madden. Our world and the Five Quarters are shadows of one another, joined by death and three wells of the sea. . . When Nechtan, warrior king of the Five Quarters is murdered, he leaves his land on the brink of civil war. His closest adviser, the druid Lyleth, has a price on her head and the evidence to condemn the real killer. Seeking to unify the land, she strikes a bargain with Our world and the Five Quarters are shadows of one another, joined by death and three wells of the sea. . .
To ask other readers questions about Three Wells of the Sea, please sign up. 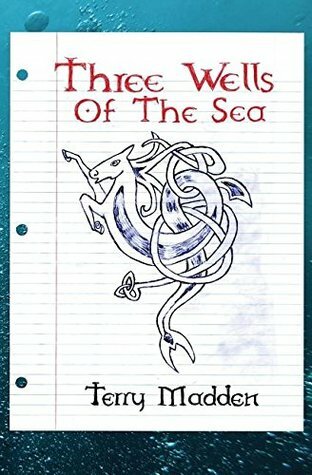 Three wells of the sea by Terry Madden - I received this free eBook from the site storycartel.com .This book exceeded my expectations at a whopping 437 pages I was shocked at how long it was .With most eBooks I have read they have been 200 pages or less but I loved this book none the less . I was supremely happy with how this book turned out it satisfied my need for adventure fantasy folk lore fiction and romance . About ;Conner is a troubled boy who att Three wells of the sea by Terry Madden - I received this free eBook from the site storycartel.com .This book exceeded my expectations at a whopping 437 pages I was shocked at how long it was .With most eBooks I have read they have been 200 pages or less but I loved this book none the less . I was supremely happy with how this book turned out it satisfied my need for adventure fantasy folk lore fiction and romance . About ;Conner is a troubled boy who attends a Christian boarding school in California he tries anything to leave by playing pranks skipping class and not turning in assignments when his teacher who he calls Dish (coach of the track team) but is know by everyone as Mr. Cavendish takes him under his wing and keeps him from getting expelled after his last major prank . Dish gets Conner into running on the track team thinking that will help Conner deal with his issues .We slowly learn that Dish has been looking for something ,a way to another world that he has obsessed about and poured over books looking for. Dish has been looking for a way in but someone in the other world has been searching for him too ,one tragic night during an accident Dish goes into a coma and Connor is blamed because he was driving the car .Connor learns about the world Dish was searching for and that his soul has been taken to that world to finish a task .Connor aims to get him back before his Dish's sister decides to pull the plug . Forgiveness ,acceptance ,adventure this book has it all . This book takes you and pulls you in and makes you root for the characters in both worlds . I was hoping the whole time that Connor wouldn't give up as he met adversity after adversity .Terry Madden thought out everything and gives us well rounded characters , a suspenseful story line believable for a work of fiction. I believe there are more books to come in this series because of the way that the story left off . I cant wait to read them as well . An old-school portal fantasy, harking back to the roots of all portal fantasy, as introduced by George MacDonald: the Celtic Otherworld. I don't usually read portal stories or Celtic fantasy any more, but this was a good one. There are two protagonists, one in each world, and both of them are focussed on the same man in two versions. A rebellious schoolboy in our world's California knows the man as his teacher and mentor; to a druid in the Otherworld, he is the king to whom she is bound. Life and An old-school portal fantasy, harking back to the roots of all portal fantasy, as introduced by George MacDonald: the Celtic Otherworld. I don't usually read portal stories or Celtic fantasy any more, but this was a good one. There are two protagonists, one in each world, and both of them are focussed on the same man in two versions. A rebellious schoolboy in our world's California knows the man as his teacher and mentor; to a druid in the Otherworld, he is the king to whom she is bound. Life and death, evil schemes, war, courage, loss, love, all crash together in a satisfying manner. The characters are vivid, and driven by their internal issues, not the demands of a pre-scripted plot. Originally I added it to my "Well-edited" shelf, but I ended up removing it, thanks to a few dangling modifiers, incorrect word choices (mindless/heedless, clamboured/clamoured, timber/timbre, sheath/sheathe), a couple of misplaced apostrophes, occasional missing commas, and some comma splices. We get a few sudden medievalisms among the ancient Celtic details: squire, palfrey, surcoat, even a corset. At one point vambraces (armour for the arms) cover somebody's knuckles. These are minor and occasional distractions in a book that mostly reads smoothly and well, and I look forward to reading the sequel. Dig your teeth into this two-world fantasy and feel the gristle. It's the real thing. "The Bear comes for the throne of the Five Quarters. I'm here to stop him." And so it begins. Hugh Cavendish, a boarding-school English teacher slips from one world to the next, to take back his life, his throne and his soul companion. He is truly neither here nor there, and his loss leaves Connor, his student ward, scrambling to discover the truth of his passage through the well of the moon's flood tide. The tw Dig your teeth into this two-world fantasy and feel the gristle. It's the real thing. "The Bear comes for the throne of the Five Quarters. I'm here to stop him." And so it begins. Hugh Cavendish, a boarding-school English teacher slips from one world to the next, to take back his life, his throne and his soul companion. He is truly neither here nor there, and his loss leaves Connor, his student ward, scrambling to discover the truth of his passage through the well of the moon's flood tide. The two halves of Cavendish's life will soon collide, but will he survive the closure? Riddled with Celtic and Norse myth, and rich in new perspectives, The Three Wells of the Sea is the first book in an elemental new series of heroic fantasy, and can be thoroughly enjoyed as a stand-alone novel. For fans of the dual worlds of Stephen R. Donaldson's 'The Land' and Stephen King's 'The Talisman.' Let's welcome Terry Madden's Five Quarters to the world just outside the one we live in. It has a spark of wonder, indeed. Three Wells of the Sea is about two different worlds that are connected by wells. When King Nechtan died in one world, he lives in another in the teacher, Mr. Cavendish, a.k.a. - "Dish". Nechtan's solas, Lyleth uses magic to draw Nechtan's soul back through the well and into a body that was once a bird of prey. This leaves Dish in a coma. Troubled student, Connor, saw Dish get drawn through the well and a tattoo appear on his arm. The second time Dish was drawn through, he went into the coma. Co Three Wells of the Sea is about two different worlds that are connected by wells. When King Nechtan died in one world, he lives in another in the teacher, Mr. Cavendish, a.k.a. - "Dish". Nechtan's solas, Lyleth uses magic to draw Nechtan's soul back through the well and into a body that was once a bird of prey. This leaves Dish in a coma. Troubled student, Connor, saw Dish get drawn through the well and a tattoo appear on his arm. The second time Dish was drawn through, he went into the coma. Connor tried to get through the well, too, in order to draw Dish back to this side, back to his body, which lies in a hospital. In the mean time, Nechtan's widow has declared herself king and a war is about to begin. I picked this book to read from Story Cartel and I'm glad I did. I'm a big fan of fantasy and have read the books of Stephan Donaldson and this one is similar. Two different worlds where humans are different, such as Hugh and Nechtan--same person, different worlds. Terry Madden has written a wonderful story here and does quite well when changing worlds. I didn't lose my place where she left off with one and remembered what was going on in the other, Not many writers can pull that off. The only th I picked this book to read from Story Cartel and I'm glad I did. I'm a big fan of fantasy and have read the books of Stephan Donaldson and this one is similar. Two different worlds where humans are different, such as Hugh and Nechtan--same person, different worlds. Terry Madden has written a wonderful story here and does quite well when changing worlds. I didn't lose my place where she left off with one and remembered what was going on in the other, Not many writers can pull that off. The only thing I hated was the ending--it was a cliffhanger so now I have to wait for the next book to come it. It will be worth the wait. Very engaging read - the storyline is well thought out and although the plot is complex at times, the writing makes it easy enough to still understand everything that is going on. I enjoyed the way the story was able to seamlessly jump in between worlds as well as the fact that the plot stayed interesting to the end - my predictions kept being wrong! I am definitely keeping my eyes out for the next book! This probably the longest it ever took me to read a book. It wasn't a slow moving book in the least. Just not a lot of time was dedicated to reading the past few months. This was a great fantasy novel. I liked the passing between the real world and fantasy worlds. Great characters and not predictable in the least. I will look forward to the next release in the series. Thoughtful and well written. A truly different approach to an "afterlife". Characters have all the foibles and nobility, high purpose and driving needs of real people. Lyl is truly driven and Nechtan is of great honor to correct the problems he created (karma ) fulfilled. I just loved it. Has a touch of Thomas Covenant - White gold Wielder in there somewhere, without the angst of Thomas Covenant. Will be looking out for Book two. Thank you to Story Cartel for their free download File for Review. It is a book of that takes you to a magical place, one full of wonder & mythology. Only this is, some of the story is confusing to follow, almost as though this was a sequel.. but overall I loved it ! Great book! Very well written! Very Imaginative! The author did a great job helping the readers understand the complexity of the story! I look forward to reading book two! I liked this book. It was well written and believable. Not sure why others would say it wasn't. It does go slow, but not in a way that bothered me. I didnt even notice til about halfway through. Its at a great pace for a series that needs a good foundation. This novel was a really exciting find for me. I was expecting just a regular fantasy novel, and was pleasantly surprised when it did not begin in a typical European fantasy setting (though it does end up there), but rather in a modern one. The book goes back and forth between these two worlds much as the characters do. Madden has blended Celtic mythology with her own imagination to create a comprehensive and interesting world. By far I was the most impressed by the characters. When we are introdu This novel was a really exciting find for me. I was expecting just a regular fantasy novel, and was pleasantly surprised when it did not begin in a typical European fantasy setting (though it does end up there), but rather in a modern one. The book goes back and forth between these two worlds much as the characters do. Madden has blended Celtic mythology with her own imagination to create a comprehensive and interesting world. By far I was the most impressed by the characters. When we are introduced to the ‘villain’ of the novel, the She-King Ava (Nechtan’s jilted wife), she appears to be a fairly one dimensional character, but as the story continues we begin to understand the pain and neglect she’s experienced, and how the people she’s trusted the most manipulate her. I was always happy when the novel would come back to her. Lyleth also really stuck out to me, being a character whose motivations are kept secret for most of the story, and when revealed we begin to really understand her complexity. There’s no character here who is pure evil, or good, just real people who are struggling with real issues (albeit in a fantastical setting). This is an interesting fantasy tale that combines a modern story of a young boy traumatized by the death of his brother and his relationship with a caring teacher at his private school, with a high fantasy tale of another world where political complex intrigue is the name of the game. The modern characters uncover ancient portals to the other world and the story moves back and forth with the actions in each world affecting outcomes in the other. I became very engaged with the modern characters t This is an interesting fantasy tale that combines a modern story of a young boy traumatized by the death of his brother and his relationship with a caring teacher at his private school, with a high fantasy tale of another world where political complex intrigue is the name of the game. The modern characters uncover ancient portals to the other world and the story moves back and forth with the actions in each world affecting outcomes in the other. I became very engaged with the modern characters that were realistically and sympathetically portrayed, and honestly, I found their stories more engaging than the stories of the kingdom described in the other world which seems to be one version of the afterlife. The writing is assured and confident. Transitions are well done, the characters are well drawn, and although the secondary world is realistic, I found it described in so much detail that I tended to lose interest. I found the modern story much more engaging, and the modern characters more interesting than the king re-animated by his female magician/lover. However, for lovers of high fantasy, I’m sure they will enjoy this book. I received this book free in exchange for an honest review. Fantastic characters in a grand adventure with a bittersweet love story at its core ... this is everything that reminded me of why I loved reading epic fantasy as a kid. Also loved the dual world structure and how it all tied together. Beautiful writing and imagery throughout. This was a decent story. The basic plot of murder to gain a throne and a man who'd rather not be king and get to marry his true love isn't orginal. The other world theme with a doorway to this magic realm isn't either. The writing is very well crafted. The characters seen real and the switches from magic realm to mundane is a good ploy to keep up interest. The author doesn't over do the Druid magic and you only encounter the "Old Blood" enough to peak your interest. Book two seems to be devoted to This was a decent story. The basic plot of murder to gain a throne and a man who'd rather not be king and get to marry his true love isn't orginal. The other world theme with a doorway to this magic realm isn't either. The author doesn't over do the Druid magic and you only encounter the "Old Blood" enough to peak your interest. Book two seems to be devoted to this magic race's plot to return to their real home. I don't rarely give 5 star ratings, however this story deserves all 5 stars for story originality, fleshed out characters, plot and ending.. So many stories now are just rehashed of the same muddled messes while this publication is fresh and intriguing. Wonderful book! I was hooked from the start, and was intrigued by the two worlds. It was hard to put down. I can't wait for part two...and I downloaded the prequel The Wood, I'm looking forward to reading that!